Located in Seattle’s Mount Baker neighborhood, Mount Baker Family Housing offers 95 units of one- and two-bedroom housing for low-income and homeless families. 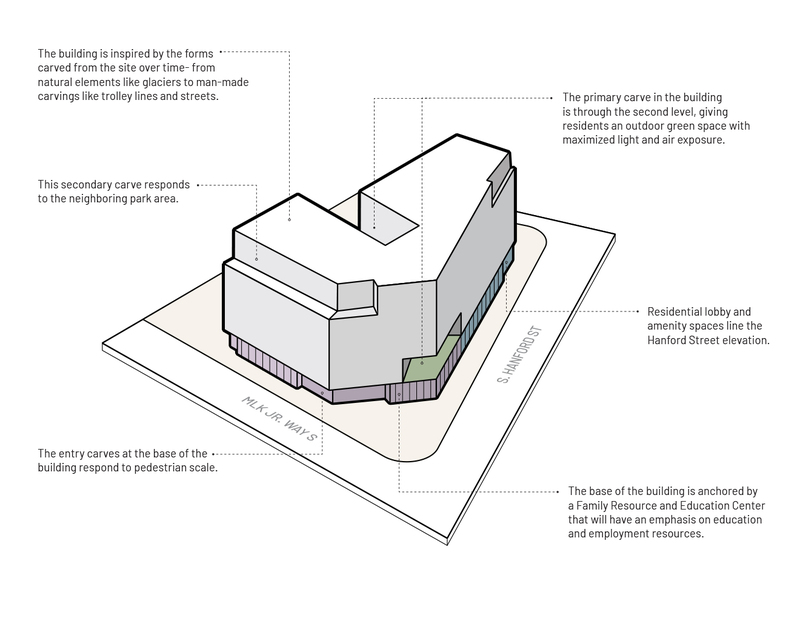 Inspired by the glacial carving action that formed the Mount Baker neighborhood, open space is carved out of the building to provide an elevated courtyard that offers relief from the traffic noise and that maximizes light and air across the courtyard. Secondary carvings at the upper floors reference the scale of the neighboring elevated light rail on Martin Luther King Way and the tree canopy on Rainier Avenue. These textured carvings also mark the corners of the building. On the upper floors, the main skin of the building is characterized by a grid of staggered windows surrounded by color accents. The ground floor features a vertical grid of colorful bars that wraps around the building and relates to the pedestrian scale. Recesses at the ground level highlight the primary entrances into the building. This transit-oriented affordable family housing building is conveniently located one block from a light rail station and between two major arterials and will feature a Family Resource and Education Center on the ground level that will provide education and employment resources for homeless families.